Brett Laduzinsky is the Director of CT Strategies, which provides strategic consulting services to clients seeking insight and innovative approaches to current border management and supply chain challenges in the U.S. and around the world. Mr. Laduzinsky spent his career in government service enhancing the security of the supply chain by means that simultaneously support economic prosperity. During his time as a Counselor to the Commissioner of U.S. Customs and Border Protection (CBP), he was responsible for advancing many of CBP’s trade transformation and modernization initiatives. His areas of expertise included export programs, single-window trade processing, trusted trader programs/public-private partnerships, and the advancement of CBP’s Centers of Excellence and Expertise. He also created a comprehensive agency strategy to market new export programs to the trade industry and other government agencies. While working for CBP’s National Targeting Center, Mr. Laduzinsky promoted CBP as a world leader in securing the global supply chain through the use of big data to identify high risk cargo and passengers crossing international borders. Mr. Laduzinsky was also responsible for advancing key supply chain security risk mitigation initiatives with both public and private U.S. and international stakeholders. 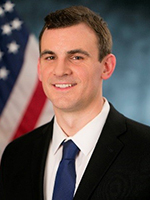 In this role, Mr. Laduzinsky served as a lead representative to the White House National Security Staff on implementing the National Strategy for Global Supply Chain Security, where he managed a Department of Homeland Security-wide initiative to develop the first ever U.S. Government ‘Risk Characterization’ of the global supply chain. In addition to international trade and supply chain security issues, Mr. Laduzinsky has developed and advanced a number of other programs and processes to increase operational efficiencies and improve stakeholder relationships. These included creating a strategic communications plan for CBP’s Electronic Device Search Policy; developing a CBP-wide system for processing inquiries on matters of civil liberties; and utilizing stakeholder recommendations to modify the CBP complaint processing website. Most recently, Mr. Laduzinsky worked for Booz Allen Hamilton as a Senior Consultant supporting the National Geospatial-Intelligence Agency (NGA) in Springfield, Virginia. During his time at NGA he created and implemented a strategic communications plan to promote the first ever Geospatial-Intelligence Professional Certification Program. ​Mr. Laduzinsky is originally from the Chicago area and is a graduate of The George Washington University.